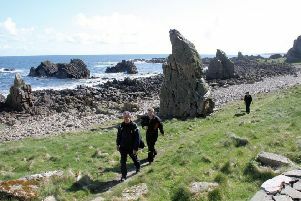 We are usually very lucky with the weather on our fortnightly walks, and Tuesday, March 29, looked set to fit the mould. In fact, had we stayed on the south side of the Cairn, we would have scored weather-wise. Our walk began at Milton of Crathes near Banchory, on a clear day. The 36 walkers split into two groups, 23 choosing the longer option, and the remaining 13 doing the shorter walk. The latter group entered the grounds of Crathes Castle and walked through the woods to the left, until the members reached the castle itself. From there, they continued through more woodland and arrived back at the castle in time for lunch, which they ate in the courtyard. Then it was back through woods at the other side, and round the lake, before arriving back at the starting point. They had seen lots of flowers and also some rhododendron bushes in bloom. They had a “wee drizzle” but the weather was otherwise fine. The main group, on the other hand, set off in a different direction and basically followed the old railway line. The path, called the Deeside Way, is pretty straight and runs alongside the road to Aberdeen. In Crathes village, we saw lots of new houses being built, and were amazed to see flowering currant coming into bloom. At Drumoak, we saw some pretty flowers alongside the path: daffodils and a bluebell-like flower were the main ones. By the time we reached thesmall hamlet of Park, we all had donned our waterproof trousers and jackets and the rain was very heavy; in fact we even had hailstones! Fortunately, Park was the turning point and we had lunch near there, in some shelter under the trees. Then it was back the way we had come. On a better day, this path should be quite an interesting one. Although it is basically straight, there are twists and turns as you approach Crathes, and a couple of times we had to think about which way to go. By the time we arrived back at Milton of Crathes, it was dry again, but the hills looked very grey. One of my passengers thought it would be very foggy at the top of the Cairn. Fortunately he was wrong: the sky was blue and clear. As we approached home, we could see that the roads were dry. We arrived home just in time for the rain and hailstones on this side of the Cairn. Our next walk will be on Tuesday, April 12, starting at the Lewis Grassic Gibbon Centre. Parking will be in the car park there, but please park in the lower part, away from the main buildings. As usual, the minibus will leave the Burgh Buildings in Laurencekirk at 10am. Mike Mackay was introduced as the speaker at the last meeting. Mike was originally from Pittenweem in Fife and completed his education at Heriot Watt with a degree in engineering. With information technology taking over in the 1970s, Mike followed this side of the industry with employment in Aberdeen, designing, building and repairing computer systems with one aim in mind, to improve company output. When he began there were 300 drawing boards with computers equipped for CAD (computer aided design) under a computer systems manager. By 1996, the job he had changed dramatically as the internet arrived and took over. Mike then had new ways of finding information from anywhere in the world. It became a process of accessing, integrating and harnessing this knowledge. There was little or no interchange of information between large companies such as Shell or BP prior to this, but this was all to change. Maintenance became shared between operators to improve their search engines. Then email arrived and it was free, no postage costs, instant mail on screens with no delays. To get an analogy with modern times, Mike used the Silk Road to compare with IT. They both carried information, as well as goods, such as spices, animals, carpets, silk, but now this could be done from any computer, anywhere there was a signal. And of course, the goods could be arranged to be collected, transferred and delivered without any physical contact between the traders. Wheras on the Silk Road the travellers would have interchanged information by word of mouth and took months to communicate, it was all over in a few hours. Mike then discussed how networking has changed our lives. An example shown was using his own telephone to check his home security, adjust or regulate his heating controls and so on from anywhere in the UK or on other continents. Banking was another example where local branches had closed and internet banking had taken over. With a phone call or two, money could be transferred, payments made to creditors or businesses, deals settled on transactions and no actual money seen or used. Digital money may well be the future. One obvious disadvantage is the loss of jobs as departments closed, but this was the price to pay for progress. Mike at one time worked with Jack Straw, the then Home Secretary, on local databases, instead of one national database. This had been an interesting talk and look into the future and past president Iain Williamson thanked Mike on behalf of the club. A very informative talk was given by Fiona Moore of Enviro Surveying Ltd, a local firm that specialises in assessing contamination problems on building sites. New regulations on the presence of oil, asbestos and many other contaminants on sites have given her young company ever-increasing work and taken her to jobs on the Shetlands to the Falkland Islands. Graham Brown, Edzell, gave a wonderful presentation on his recent climbing experiences in Patagonia with excellent slides of this climbers’ paradise with its unique but awesome terrain. He also spoke of the lives of the Patagonians and the changing seasons in these remote regions. The Mearns Young Farmers Club has had a very successful year and club members Fiona Middleton, Derek Anderson and Ryan West spoke to the Rotarians about their impressive achievements at local and national level and their innovative plans for the coming year. Scott Constantine, deputy station officer at Montrose, informed the club of the important voluntary work of the local Coastguard Service. The members were astonished at the different rescue work and all the other emergency agencies with which it must co-operate and co-ordinate. Geoffrey Lubbock, a native of Angus but now residing near Boston, Massachusetts, talked about his grandfather, Lord Boyd Orr, the Nobel Prize winning nutritionist and polymath who founded the Rowett Institute in Aberdeen. He also gave his thoughts on the imminent American election with his humorous but balanced views on the controversial Donald Trump. This week some eight members took part in a “scatter week” and took the opportunity to visit the Banchory Rotary Club in the Burnett Arms Hotel. The club is also in the midst of selecting two lucky local students for the annual £1000 Rotary Youth Leaders Awards which will give them a memorable week at the Abernethy Outdoor Centre. In addition, the members held a successful International Night, in the Dickson Hall, which raised some £700 for charities and the club also organised the annual primary school quiz which involved the seven local schools. Various local charities have been the recipients of support including the Kincardine and Deeside Befriending, the Young Carers’ Project, the Fettercairn Hall and the Laurencekirk Christmas lights and national and international causes – Polio Plus, shelter boxes, shoebox appeal and the air ambulance service. Upcoming summer events include a duck race, the primary school football tournament, the Walter Kinnear Dinner, the UCAN cycle charity ride for prostrate cancer, the Aberdeen youth concert, the annual barbecue and, of course, stalls at the Fettercairn Show and, hopefully, the Laurencekirk Gala. All the dates will be advertised in the Observer and the local website, AB30. The bridge season concluded with a fun night and prize giving last Wednesday. The fun night winner was Veronica Davies and second was Mandy Woodford who only started playing in October. The club championship was won for the second year running by Pat Walton and Gordon Shanks, second were Peggy Kemp and Scott Annand (assisted by David Leishman) and third were Margaret Clowes and Ann Gray. We wish Gordon and Youssef all the best in the final of the Scottish Bridge Union Pairs Championship later this month. Next season starts in October, meantime anyone interested in playing or learning could contact Scott Annand on 01569 730414. At their last Tuesday morning meeting members listened as David of the Aberdeen Samaritans put, what might have been, a sombre subject in an optimistic light. The Samaritans were founded in 1953 by a London parish minister at a time when London’s suicide rate was four a day and when a suicide survivor could be sent to prison (a place where the suicide rate increases by a factor of six). The Rev Chad Varah decided that society could do better for those going through difficult times. His opening of his church doors to these troubled people received an overwhelming response. Of course, most people’s problems fall well short of suicidal thoughts – we all, at times, experience problems that bring on negative emotions – so a cup of tea and a heart-to-heart with a volunteer parishioner was sometimes enough to set many of them on their way. But to cope with the obvious demand for a sympathetic ear it was deemed essential to expand the numbers of volunteers and offer a telephone helpline. Today there are 201 branches across the UK and Irish Republic manned by over 21,000 volunteers who handle five million contacts a year. In 2014 there were 700 suicides in Scotland alone, one every 12 hours. This rate is 30 per cent higher than England and Wales though, thankfully, it is falling. It is vitally important that callers have trust in the person they are speaking to, so volunteers are trained to be non-judgemental and also to reassure the caller that the conversation is completely confidential. Calls (to 116123) are free and Samaritan lines are open all 24 hours, 365 days a year. The work can also be very demanding for volunteers. On average a ‘volunteer career’ lasts about three years so new volunteers are always welcome.Samaritans have other initiatives. Their work in prisons aims to help authorities identify prisoners who can be trained as listeners to help other inmates. They work with Network Rail at stations where there is a high suicide rate and teach staff to spot potential ‘jumpers’. Here in the North East GPs can tell their patients that, if they wish it, Samaritans can call them for a chat. And lastly David told us that the £3.5 million grant to Samaritans that the Chancellor announced in his latest Budget was specifically to be used for their work to expand the Support Network of the Armed Forces. The vote of thanks was proposed by John Callander. Stonehaven Cats Protection is holding a table top sale at the Planestones, off the Market Square in Stonehaven on Saturday, April 9 from 10-2pm. It certainly looks to be the case that the pupils and staff of Mill O’ Forest Primary School agree with the maxim that reading is the key to all learning. World Book Day was March 3 and we joined thousands of other schools to celebrate. Many pupils dressed as a favourite character from a book standing in the playground that morning, it really looked like the children’s shelves of a walking, talking library! The school also hosted a travelling book fair on March 17 and 18. This gave the children the opportunity to cash in their book tokens whilst help raise funds for the school. The book theme didn’t end there though, at the end of the same week, the P5 pupils organised an internal event called “The Big Book Swap.” All pupils throughout the school had been encouraged to bring in any unwanted books in exchange for vouchers and, on March 4, they were given the opportunity to exchange the vouchers they had earned for books from the huge selection which had been donated. It was a great idea which was fun, free and very green. In fact, the school’s eco committee has also joined in on the reading initiative this month. Although we were very proud to receive a fifth gGreen flag last year, the hard work continues. The committee has signed up to the “Read to Feed” event organised by the charity “Send a Cow.” The charity transforms the lives of the poorest of families in Africa by providing resources and knowledge to grow their own food, to create a surplus to sell which allows their own children to be educated. The “Read to Feed” event involves every child in the school being sponsored for every book, chapter or page that they read (depending on their age) during the month of March. This enterprise not only satisfies the pupils’ hunger for knowledge by reading books but also feeds their desire to sustain our world. Since you heard from us last, the pupils’ success in competitions outwith the school has continued. We are delighted to report that the Mill O’ badminton team – Abi Davidson, Ryan Henderson, Cameron Gaskin and Danny Ferrero won the Kincardine primary badminton competition. In the North East regional Rotary quiz, our P7 team, Hamish, Alex, Aaron and Ramone excelled by winning the regional heat. Their team is now through to the North of Scotland Finals in June. We wish them all the best for the finals.